The UK's biggest coal producer is making a profit for the first time in three years, it has announced. UK Coal, which supplies 7% of the UK's electricity generation needs, saw half-yearly profits of £7m. The firm, which has deep mines in Yorkshire, Nottinghamshire and Coventry, reported losses of £30.5m for the same period in 2005. Chairman David Jones said the medium-term outlook for deep mines now appeared "attractive". UK Coal, which owns the former assets of British Coal, last made profits in 2003. Mr Jones put the improvements down to a series of initiatives, including a reduction in the amount of time lost to production gaps and a cut in costs following restructuring efforts. UK Coal has mothballed three of its deep mines: Rossington, near Doncaster: Ellington in Northumberland; and Harworth in Nottinghamshire. The company has five remaining deep mines in use and said that despite under-performance in July and August, the sites were likely to be operating at a profitable level over the remainder of this year. UK Coal said existing long-term contracts would expire over the next 18 months and were likely to be renewed at much higher market prices. Mr Jones added: "Coal mining in the UK will continue to be a demanding activity, but it is clear that management action has established a robust platform for addressing the challenges." 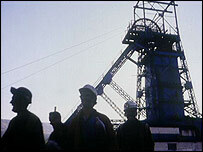 Is UK coal mining on the up?